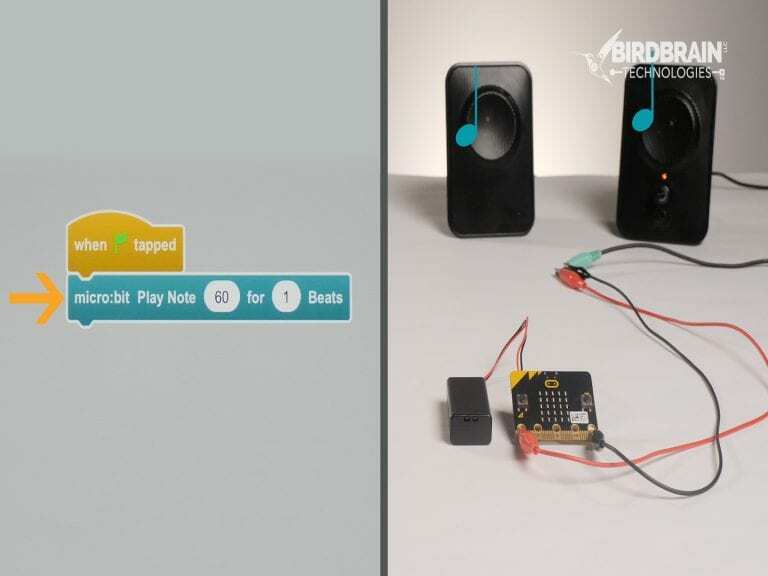 We created BirdBlox as a tablet-based programming option for the Hummingbird. 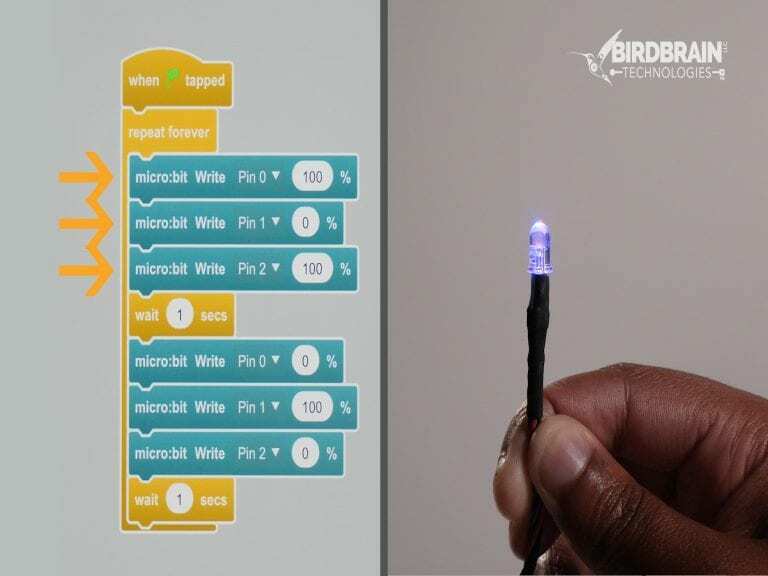 Since the Hummingbird Bit is based on the micro:bit, you can also use BirdBlox to wirelessly program the micro:bit! 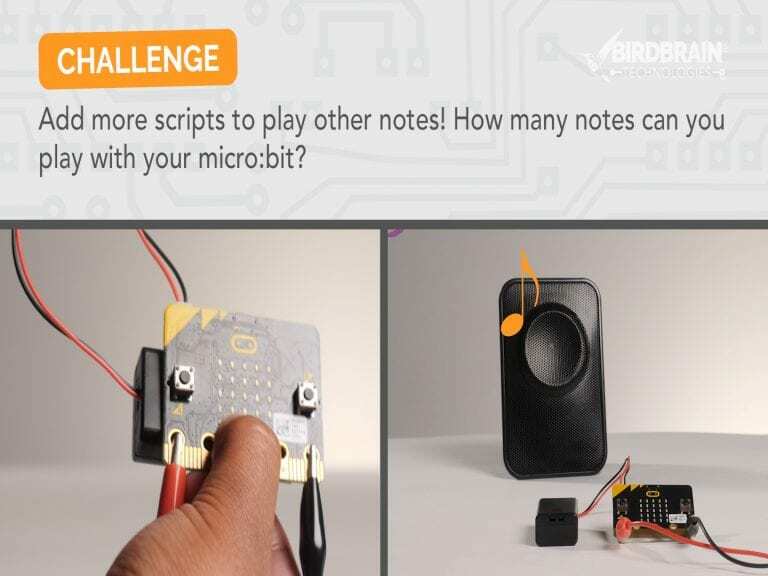 This module will cover how to set up the micro:bit to start programming in BirdBlox. 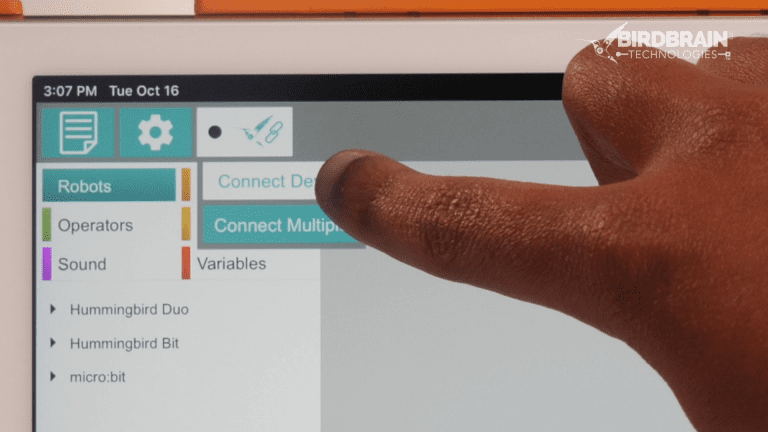 Install BirdBlox onto your tablet or smartphone. 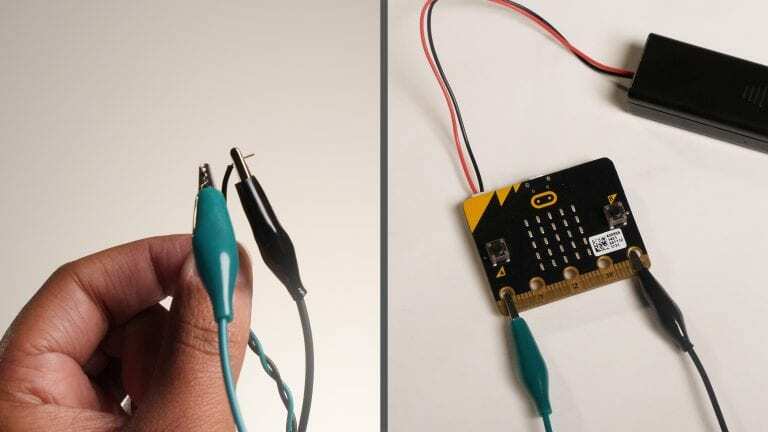 Connect the micro:bit to the computer with the USB cord. 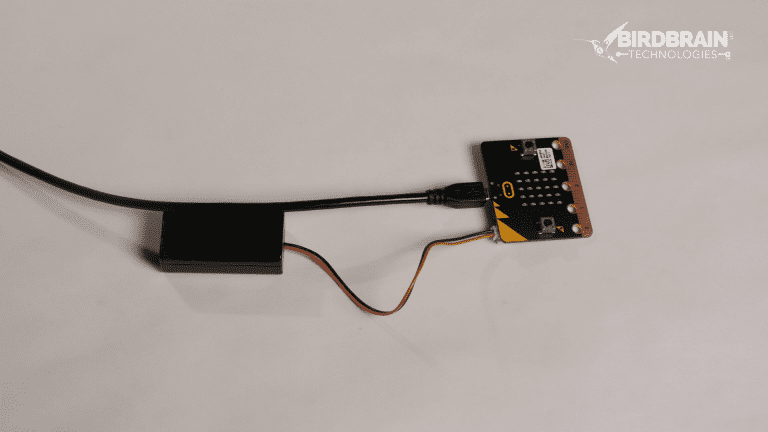 The micro:bit also needs a source of power, so connect it to the battery pack. 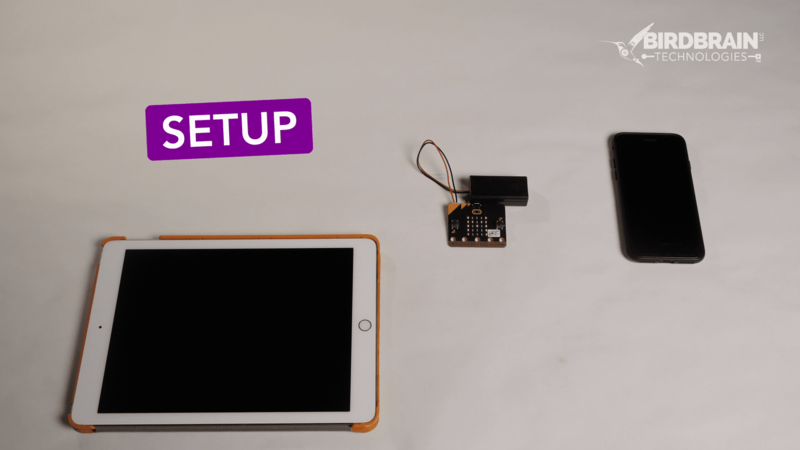 Download this file onto your computer and drag it onto the micro:bit (you will need a computer with a USB port for this step). Your device should start to flash three letters on its display. 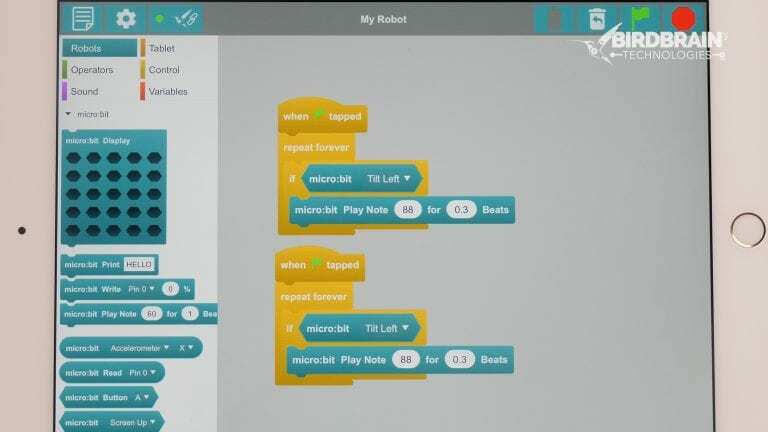 Note: If you also use MakeCode with your micro:bit, you will need to repeat this step each time you switch from MakeCode to BirdBlox. Remove the USB cord. 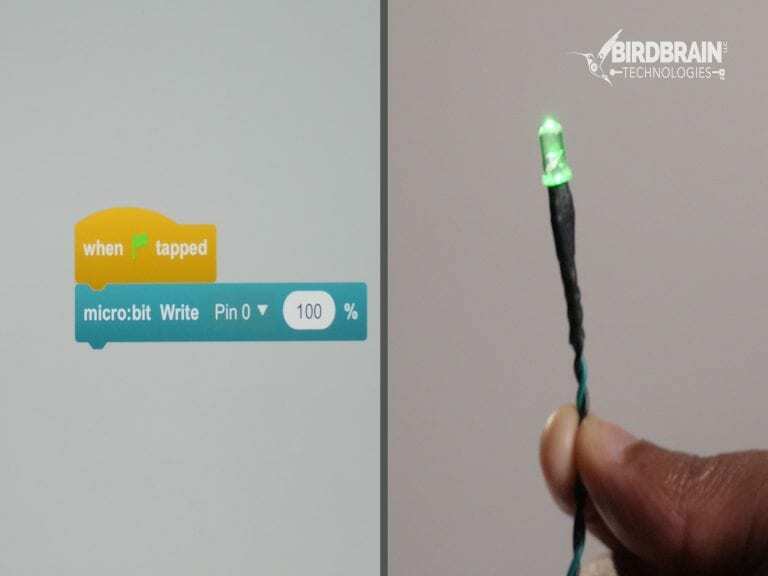 You won’t need it to use BirdBlox! 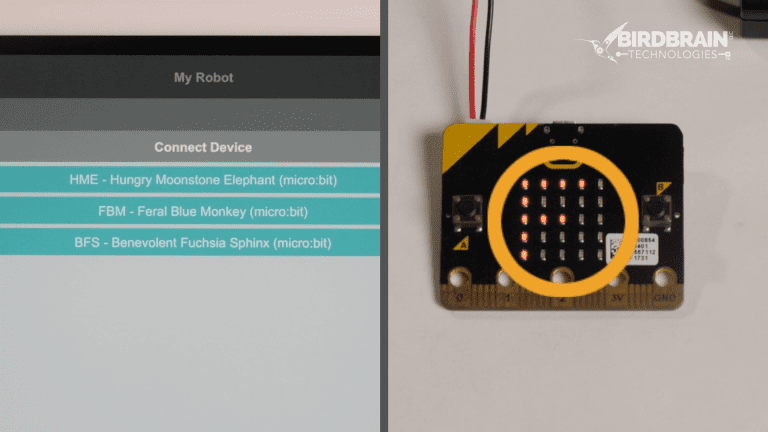 This module will show you how to connect BirdBlox to the micro:bit via bluetooth. 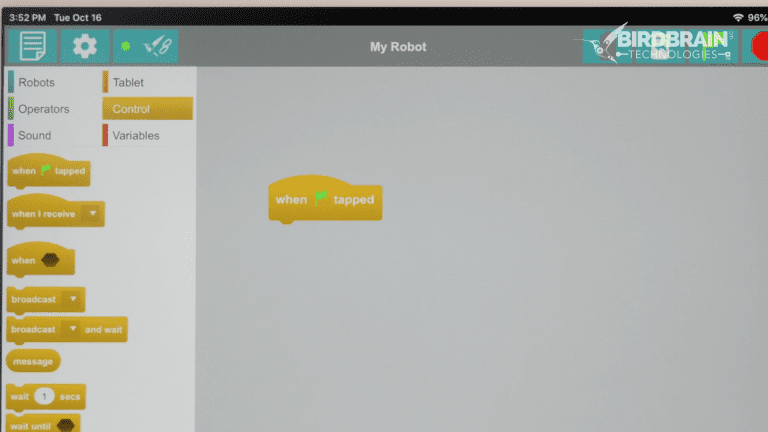 Tap New to create a new program. Give it a descriptive name. 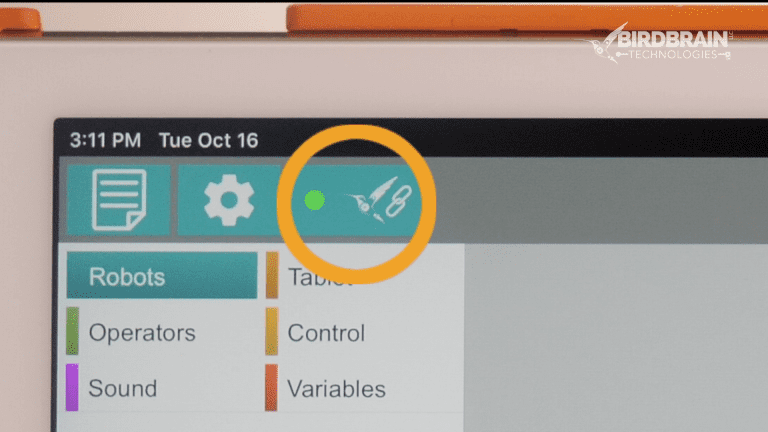 Tap the Hummingbird Connect button. Select Connect Device. 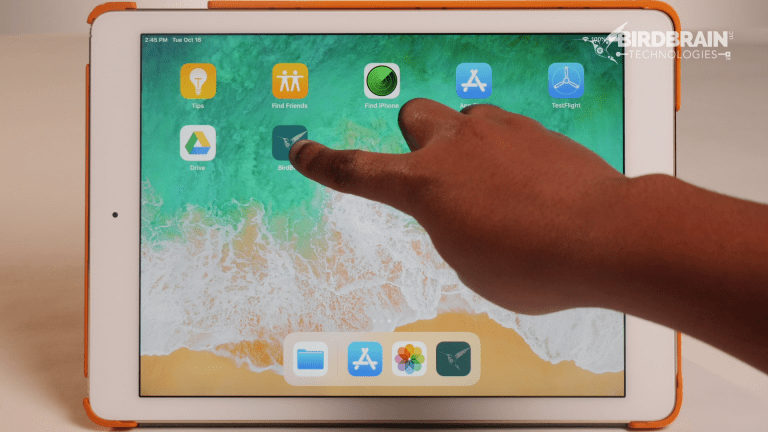 Tap the name of your device. 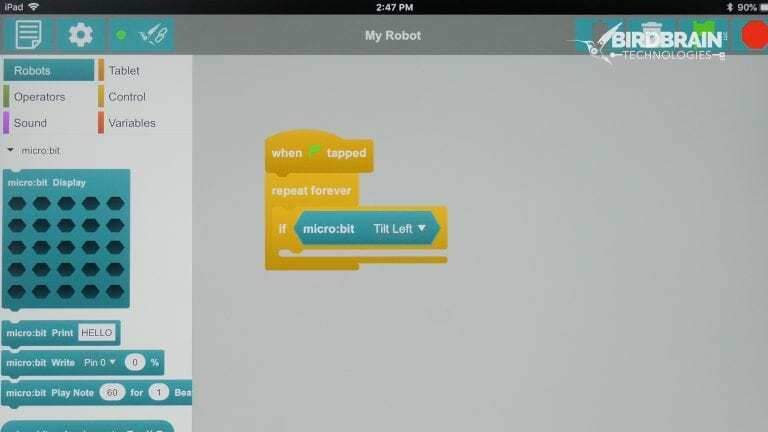 To identify your device, look at the initials flashing on the micro:bit. Match these to the name on tablet. 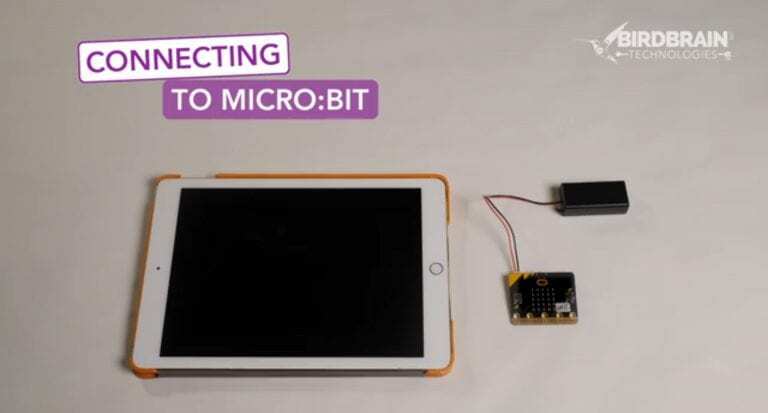 When you connect to the micro:Bit, the initials will stop flashing. 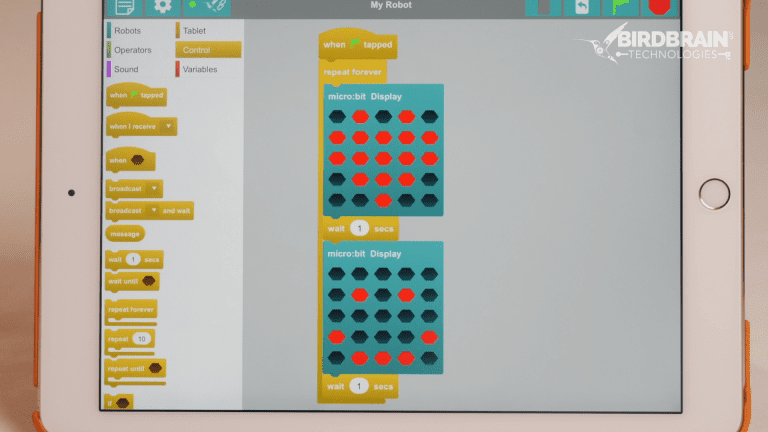 On the tablet screen, the dot on the Hummingbird Connect button will turn green, and the blocks for the micro:bit will turn teal. 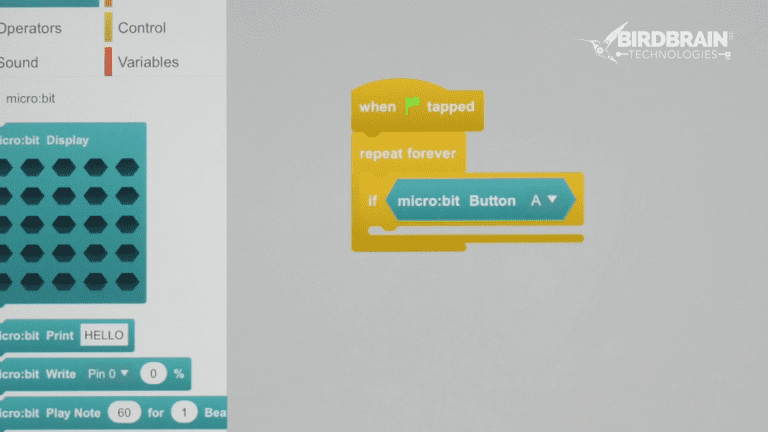 Note: If you lose the connection to the micro:bit, the initials will start to flash, the dot on the Hummingbird Connect button will turn red, and the blocks for the micro:bit will turn gray. If this happens, tap the Hummingbird Connect button, select Disconnect Device, and then reconnect. 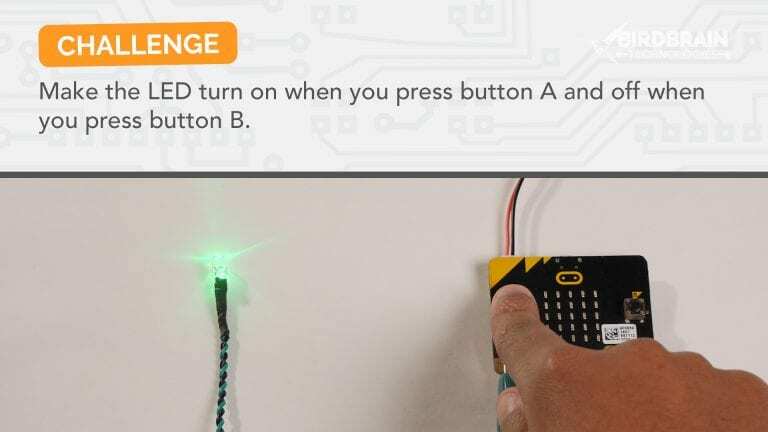 If you are not connected to the micro:bit but the initials are not flashing, try changing your batteries! 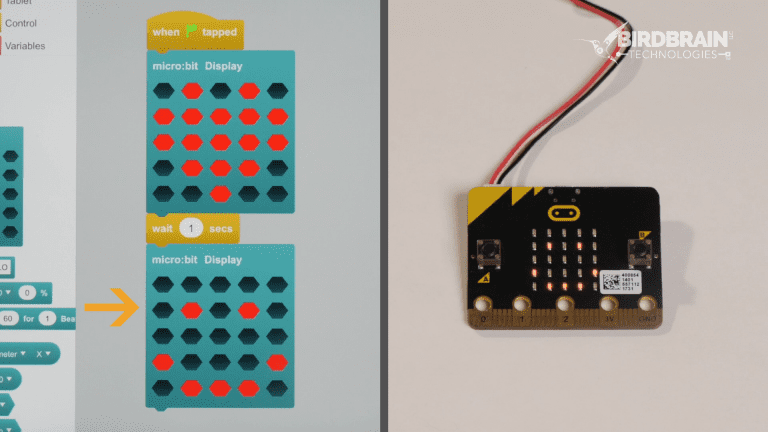 The surface of the micro:bit contains 25 tiny LEDs that you can use to make pictures and patterns! 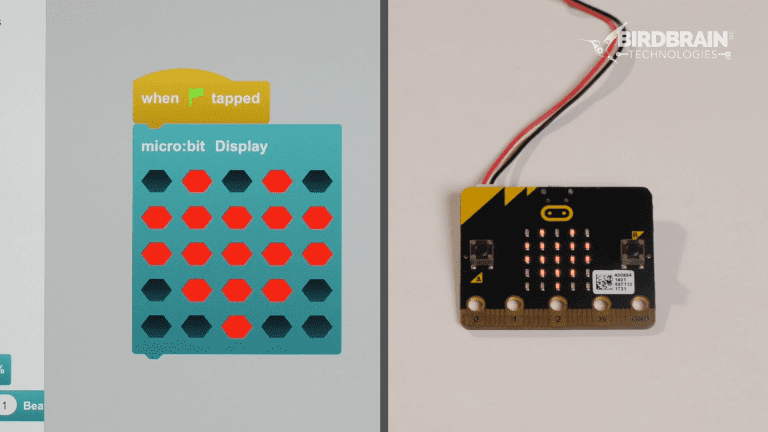 This module will show you how to use the micro:bit LED display in BirdBlox. Every program should begin with an event. An event is an action the computer can recognize. We will start our program by tapping the green flag in the upper-right corner of the screen. 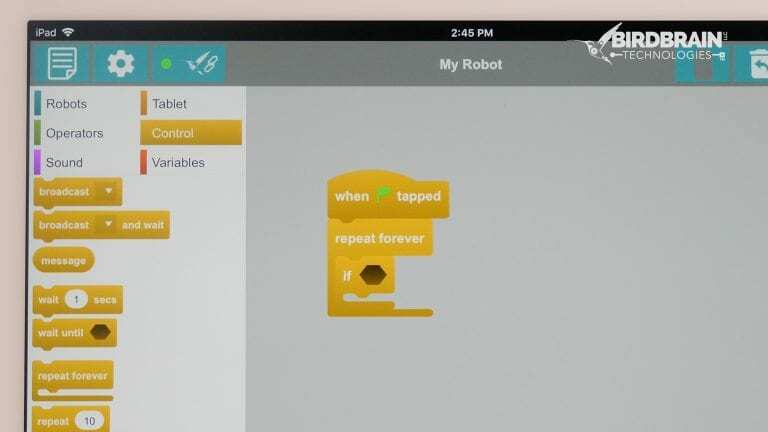 The micro:bit blocks are on the Robots menu in BirdBlox. 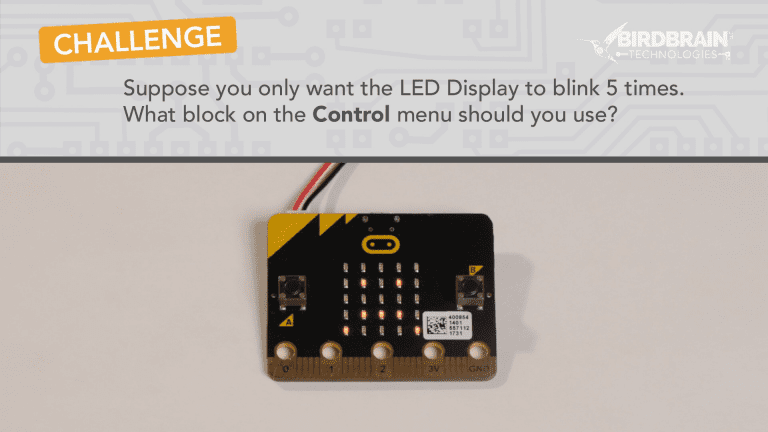 The micro:bit Display block lets you pick which LEDs should be on and which should be off. 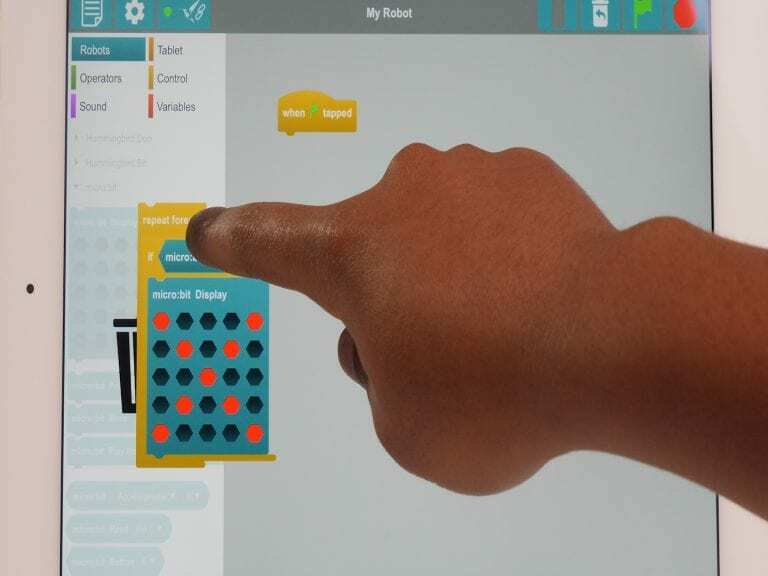 Tap the green flag to run your first program! The wait block stops the program for a number of seconds. 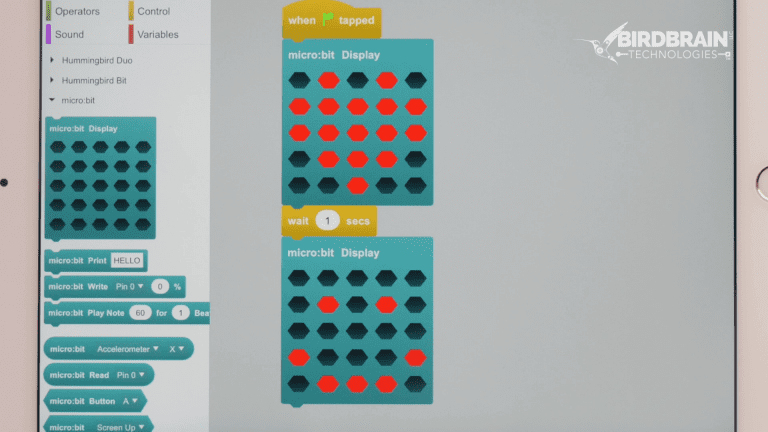 Add another micro:bit Display block to display a different pattern. Note: The video shows one pattern, but feel free to create your own! Tap the green flag to run your program. 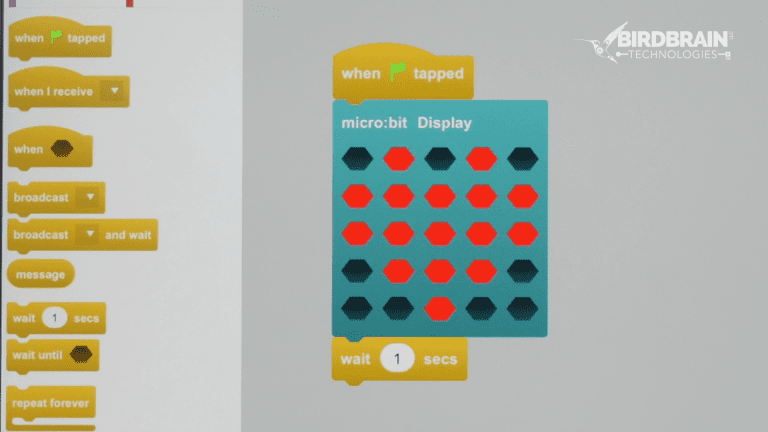 Drag the micro:bit Display and wait blocks into a repeat forever loop. 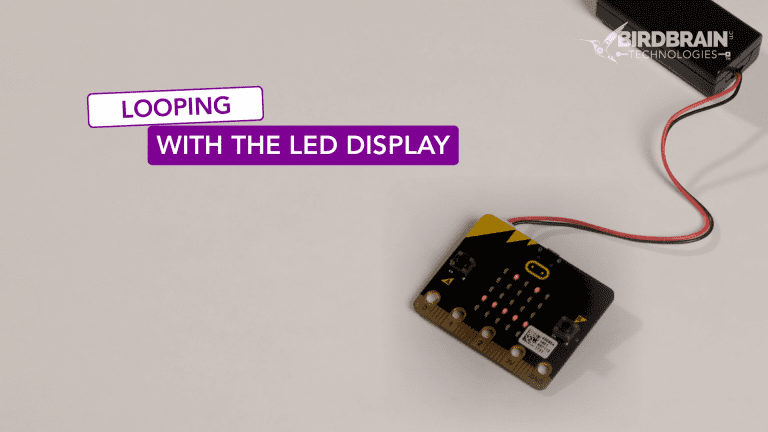 Now your LED Display will blink over and over! 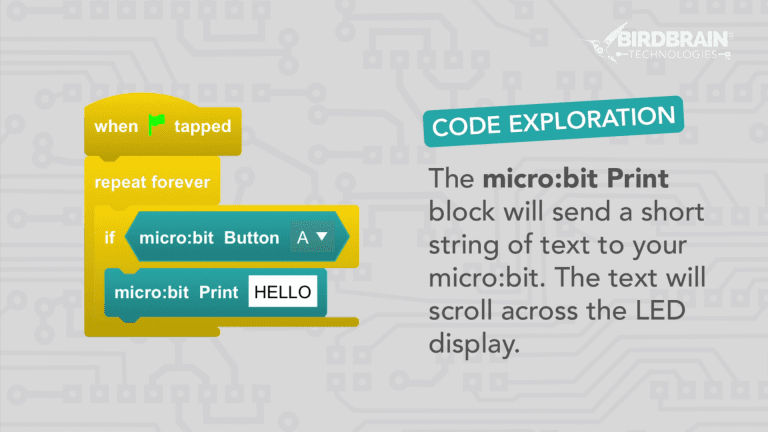 The micro:bit can detect when you press a button or move it in different ways. 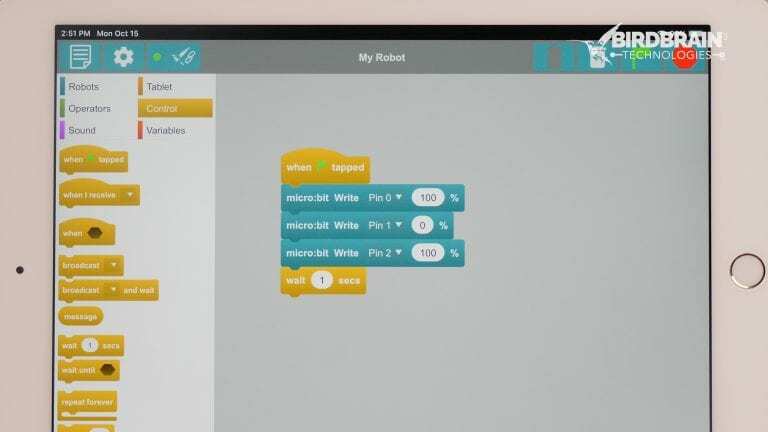 In this module, you will write programs that use these motions to control the micro:bit. 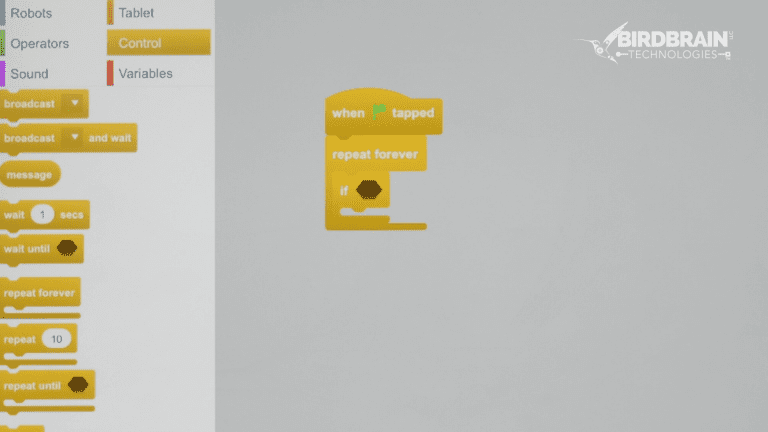 Leave the when tapped block, but delete any other blocks. 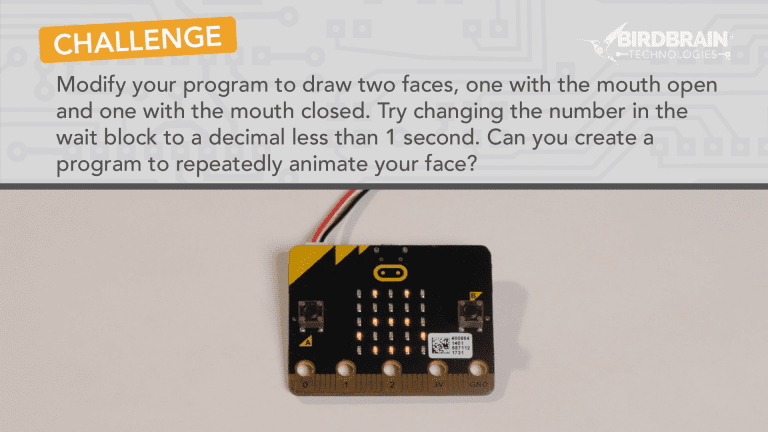 You can use the micro:bit to enable a program to make a decision. To do this, use an if block. The if block has two parts. The top of the if block has a hexagonal space. This space requires a Boolean block, which is a block that can be either true or false. 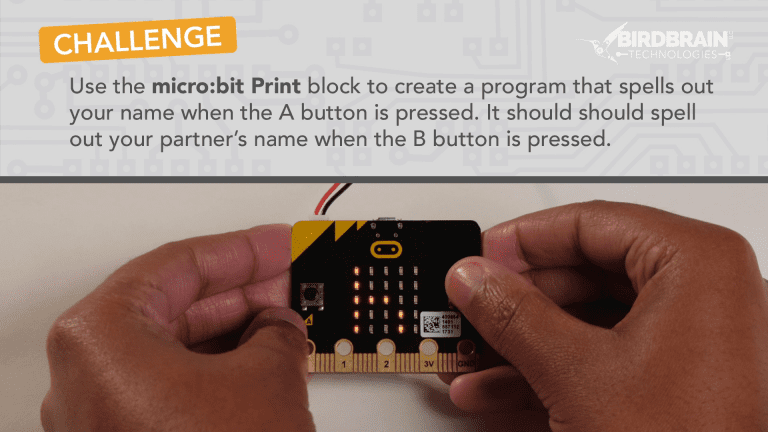 The micro:bit Button block is a Boolean block. This block is true when button A is pressed and false otherwise. 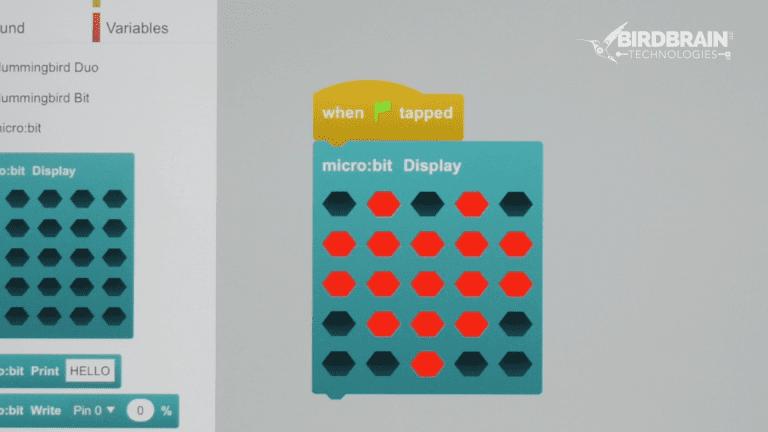 You can place a micro:bit Display block (or other blocks!) inside the if block. Tap and hold your script to duplicate it. Select button B in the copy. 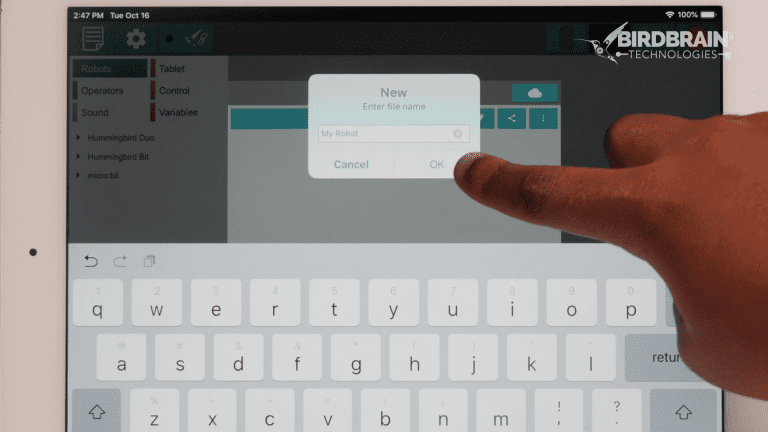 Modify the second script so that the display turns off when you press button B. 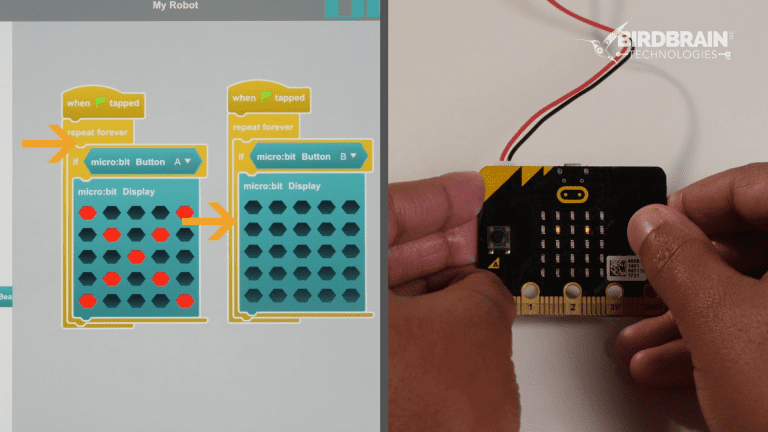 If button A is pressed, the Boolean block in the left script is true, and and micro:bit displays an ‘X.’ If button B is pressed, the Boolean block inside right script is true, and the LED display turns off. 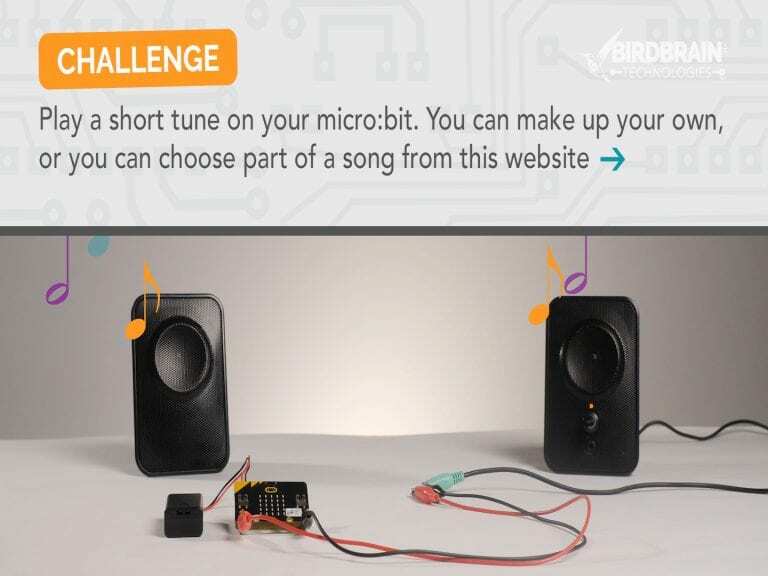 This module will show you how to connect your headphones, earbuds, or speakers to the micro:bit and play music in BirdBlox. 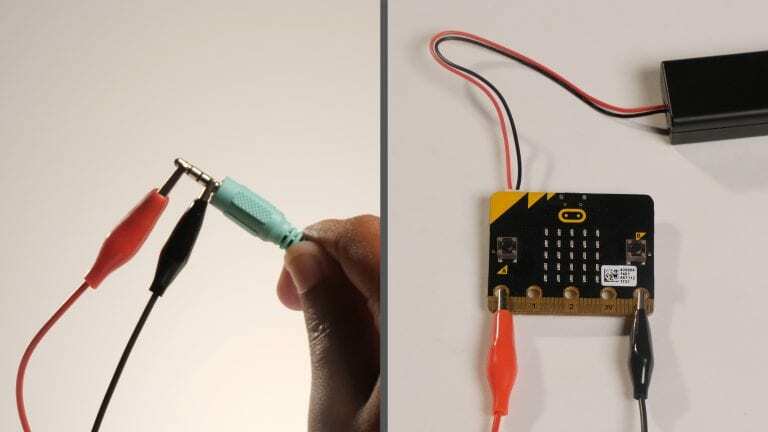 Use alligator clips to connect the base of your headphone jack to the GND pin and the tip of the headphone jack to pin 0. Leave one when tapped block, but delete any other blocks. 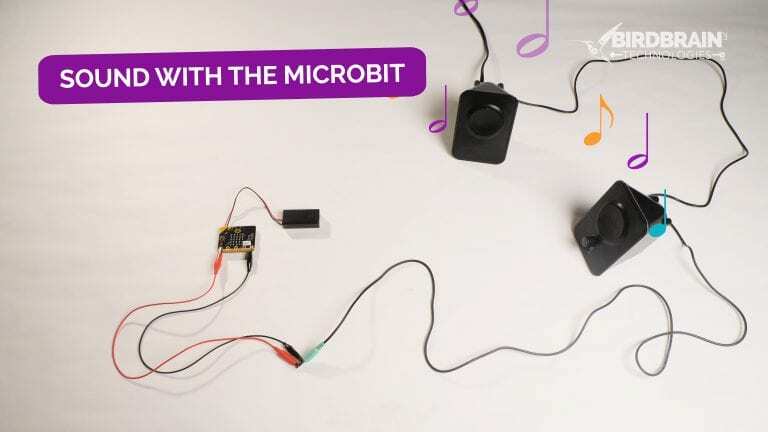 You can use the micro:bit Play Note block to play a note over your headphones or speakers. 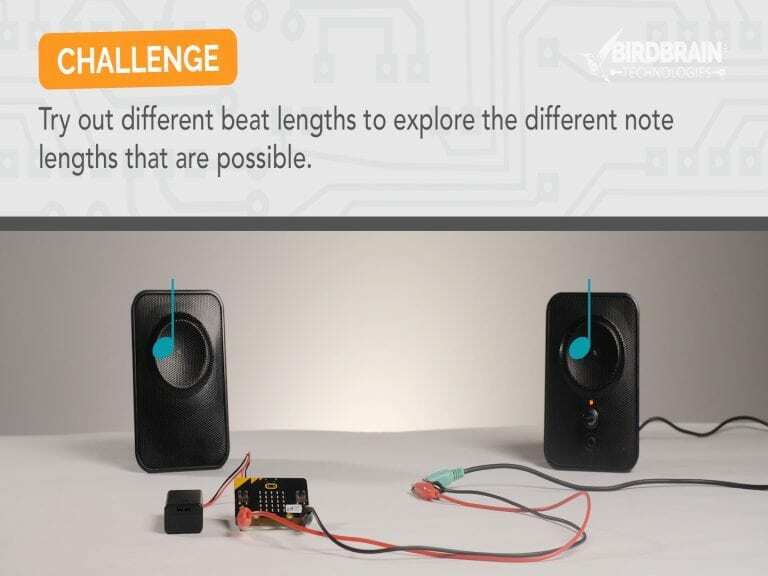 Note: Be careful to adjust the volume so that the notes are not too loud. 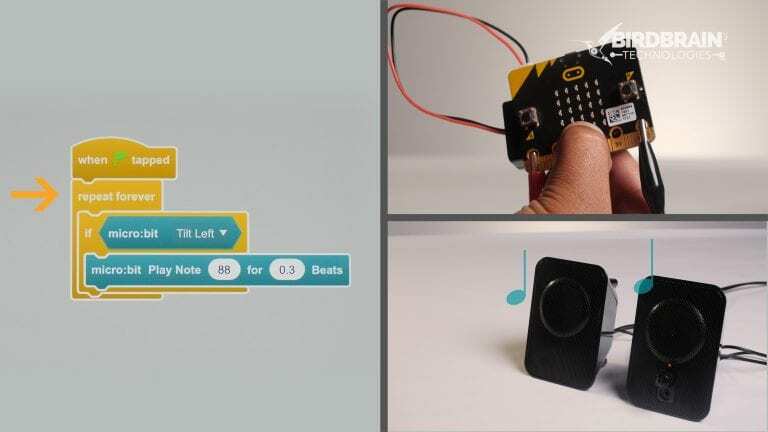 You can also use a decision block to play a note when you press a button or move the micro:bit in a certain way. 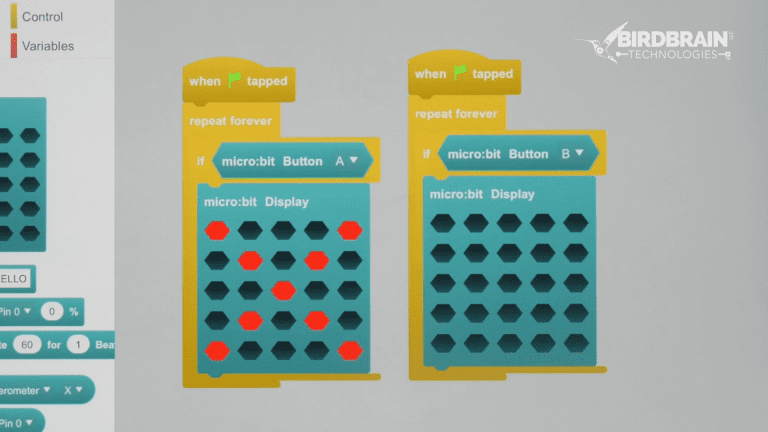 In the last module, you used the micro:bit Button block. 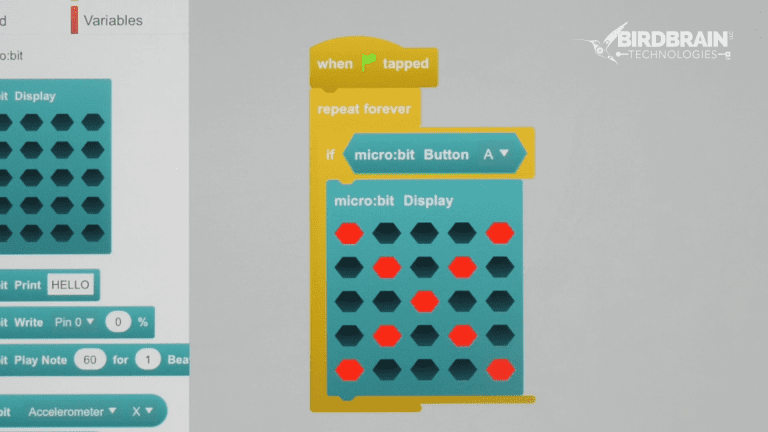 There is also a micro:bit Boolean block that depends on the orientation of the micro:bit. 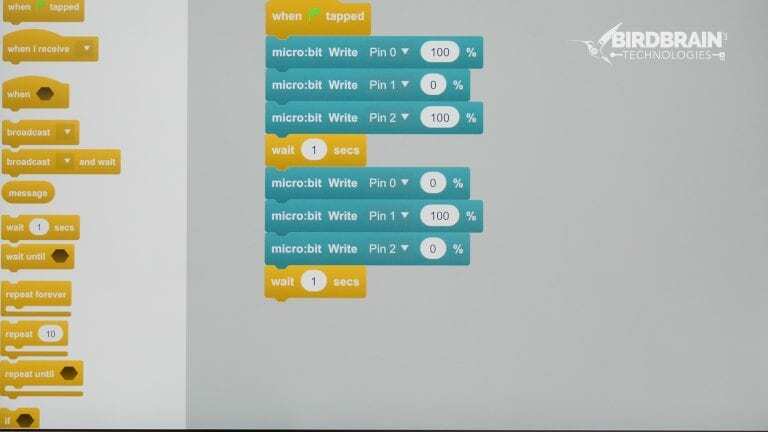 This block is true when the micro:bit is in the selected orientation and false otherwise. 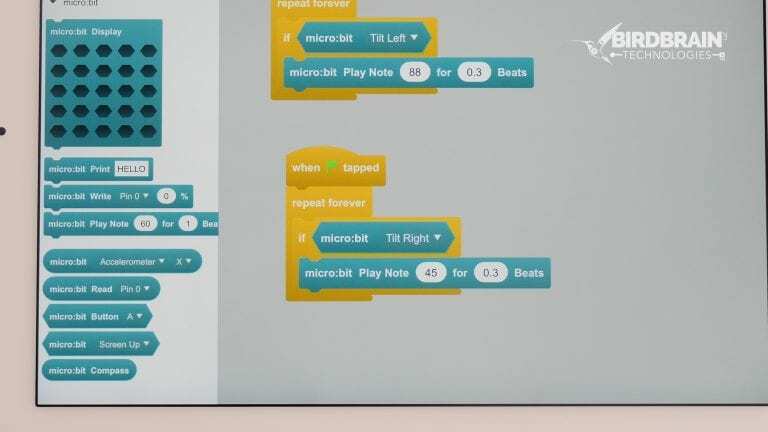 This program will play a short, high note when you tilt the micro:bit to the left. Tap and hold your script to duplicate it. 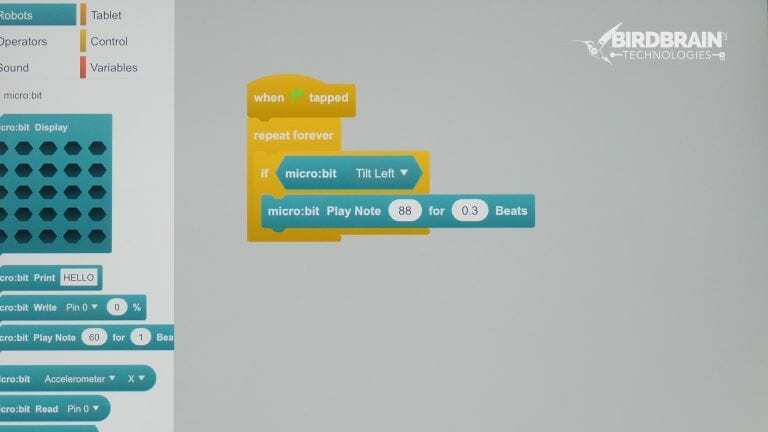 Change the copy of the script to make it play a low note when you tilt the microbit to the right. 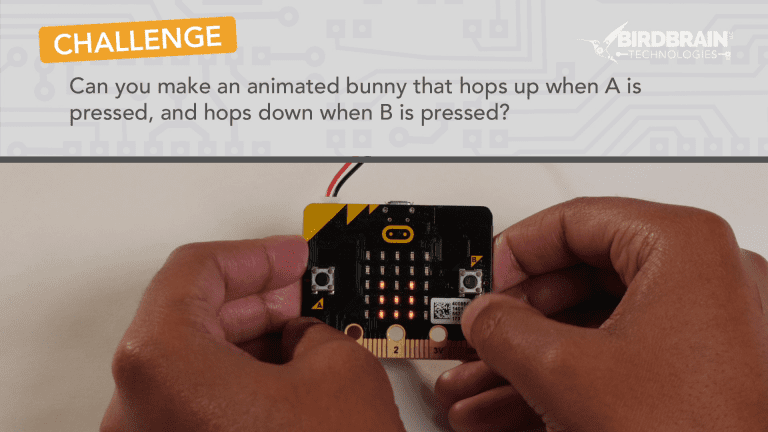 As you saw in the last module, you can expand the micro:bit by connecting alligator clips to the edge of the board. The areas where you connect alligator clips are called pins. 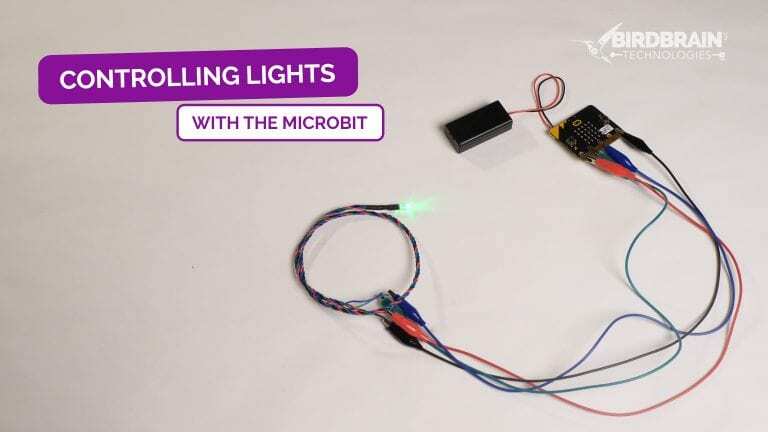 This module will show you how to use these pins to control small lights called LEDs. 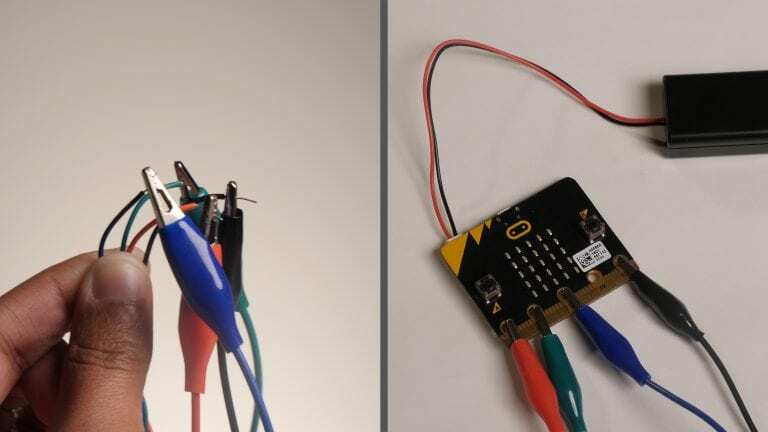 Use alligator clips to connect the – pin of a single color LED to GND on the micro:bit. 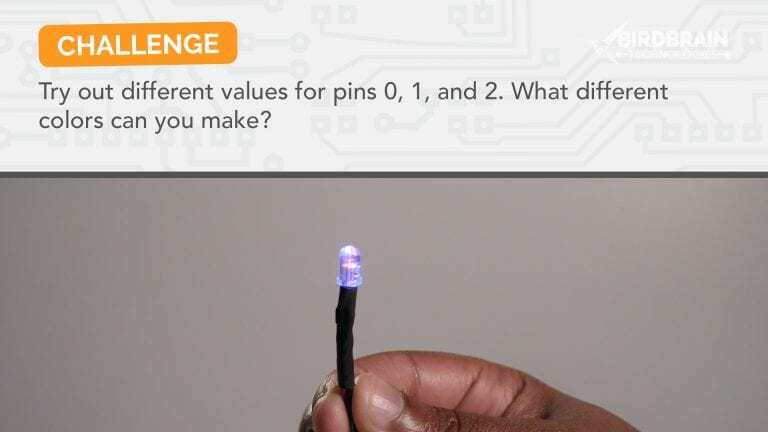 The + pin of the LED should be connected to pin 0 on the micro:bit. 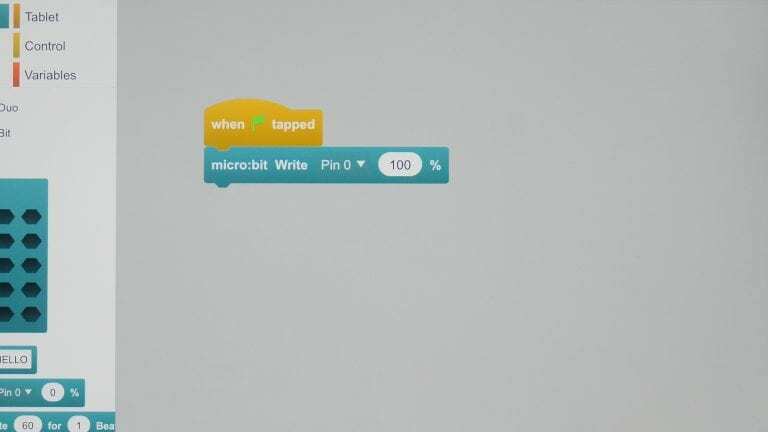 You can use the micro:bit Write block to turn on the LED. 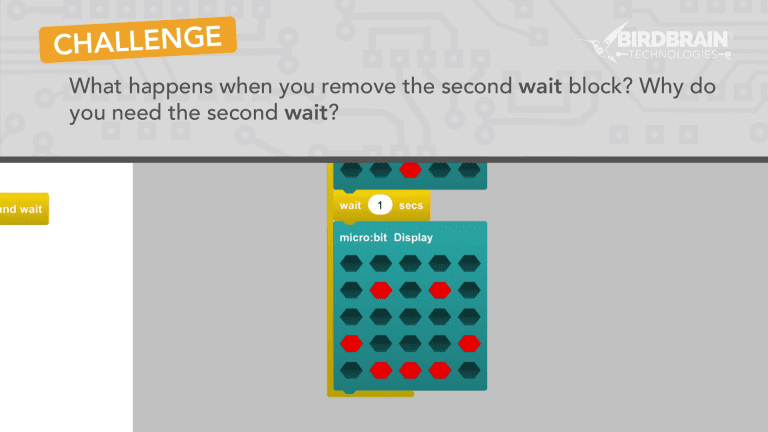 To use this block, first select the pin to which the LED is attached (0 – 2). 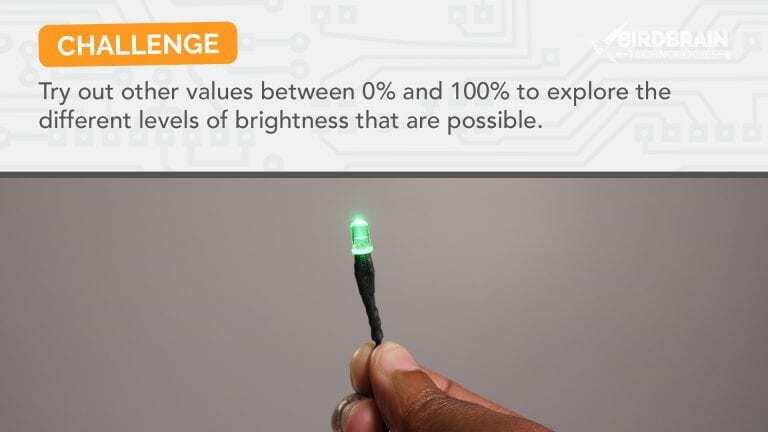 Then set the brightness of the LED from 0% and 100%. 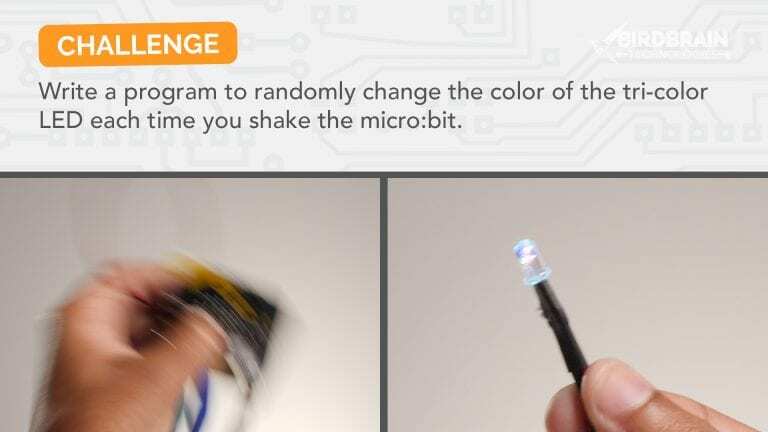 You can also connect a tri-color LED to the micro:bit. 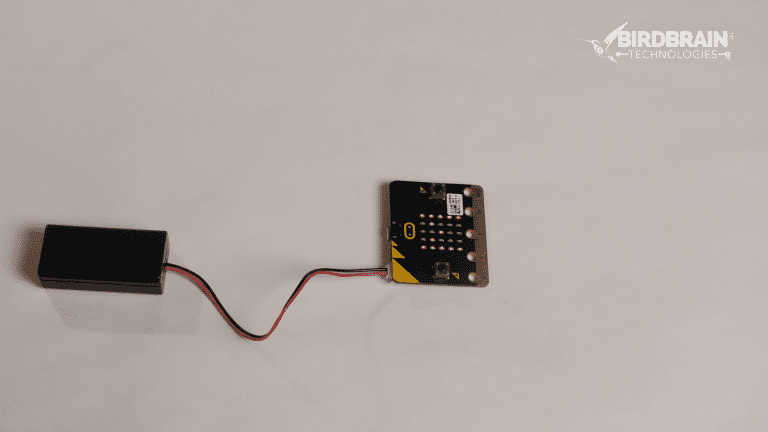 Connect the – pin on the tri-color LED to the GND pin on the micro:bit. 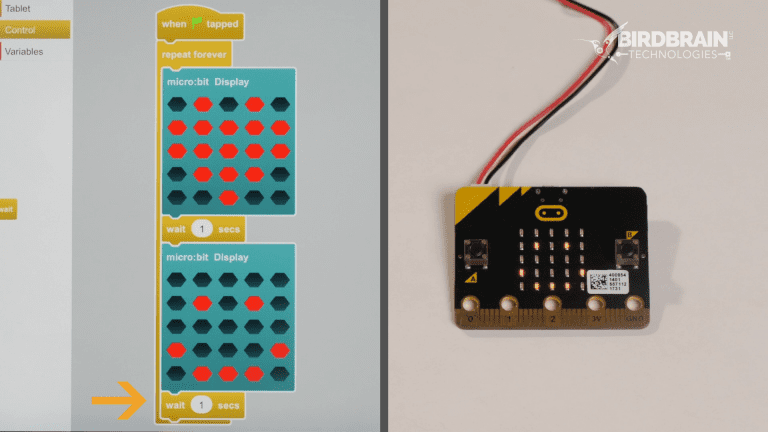 Connect the red, green, and blue LED pins to pins 0, 1, and 2 on the micro:bit. A tri-color LED has three tiny lights inside it. You can make many different colors by mixing the proportions of red, green, and blue light. 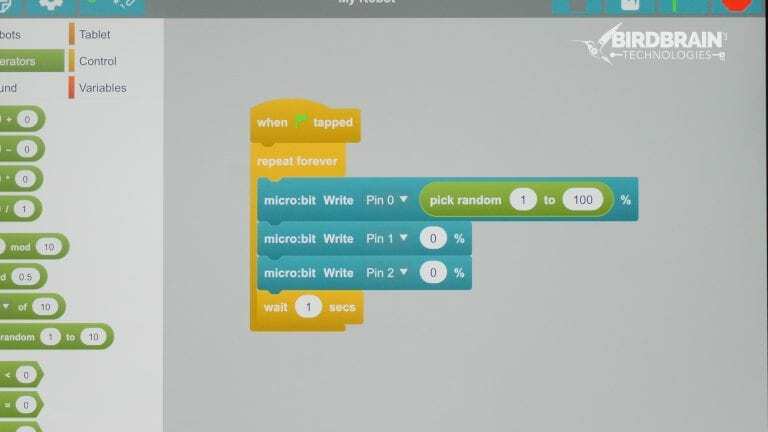 Use a micro:bit Write block to set the amount of each color from 0 to 100%. Add a wait block after setting all three pins. 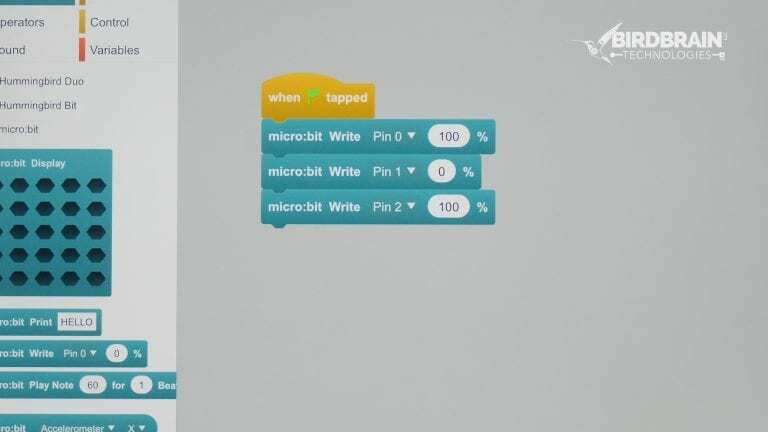 Duplicate the four blocks in your program and set the micro:bit pins to three different values. Add a repeat forever block. Now your tri-color LED will blink over and over! 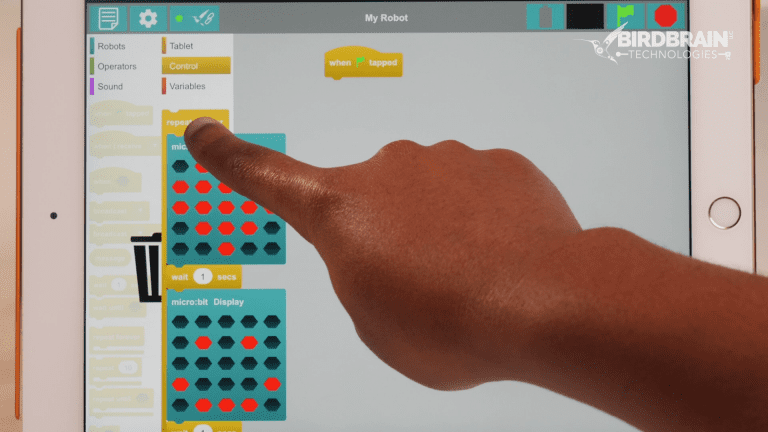 You can use the pick random block from the Operator menu to set a pin to a random value once each second. By default, the block generates a random number between 1 and 10, but you can use different values. 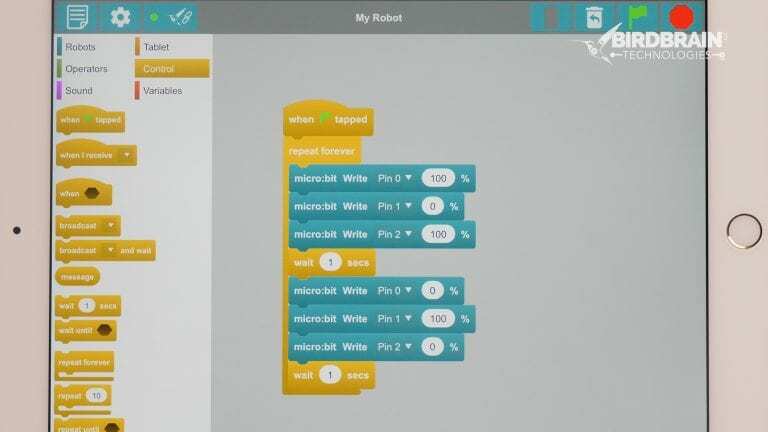 In this module, you have learned to use the pins on the micro:bit to control an LED. 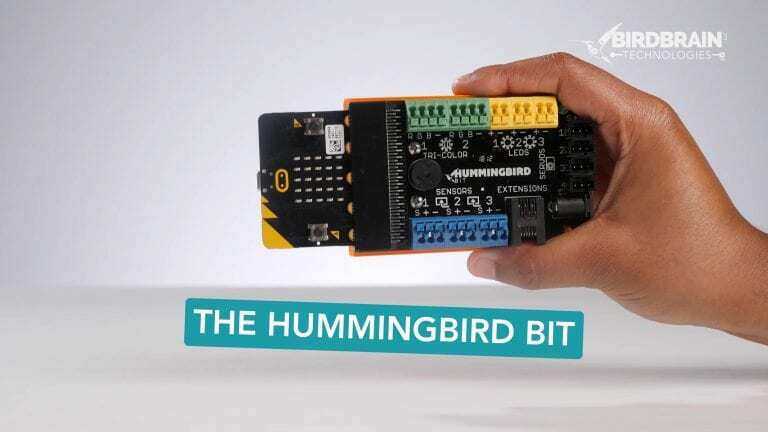 If you want to extend what you can do with the micro:bit even further, try the Hummingbird Bit! 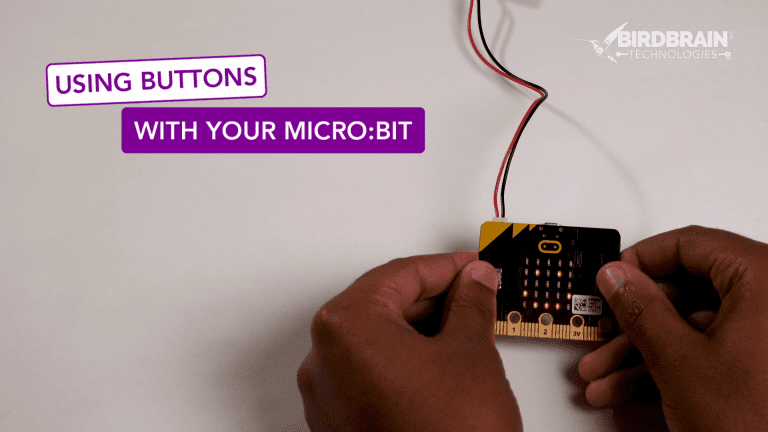 It enables you to use multiple lights, motors, and sensors with the micro:bit. 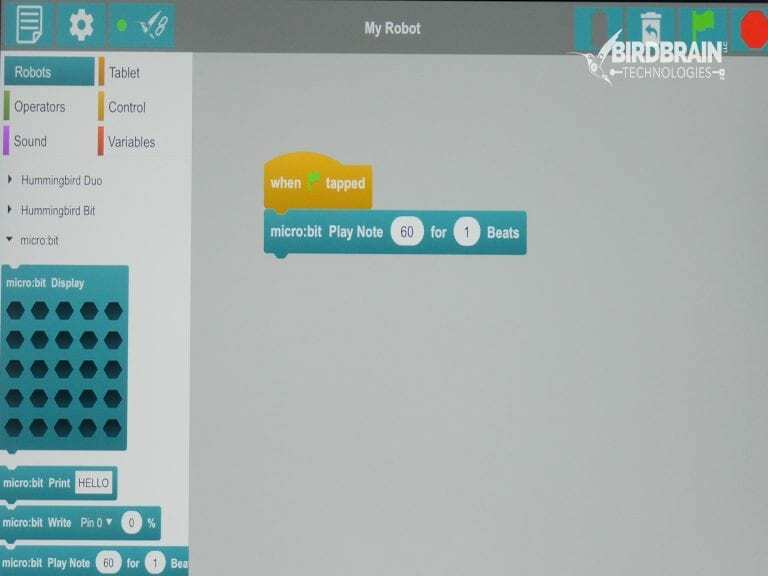 Build your own robots and program them in BirdBlox!